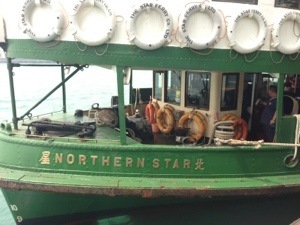 I eschewed the more direct subway route when I arrived in Honkers and opted for a stroll and a trip on the Star Ferry from Kowloon to Central. 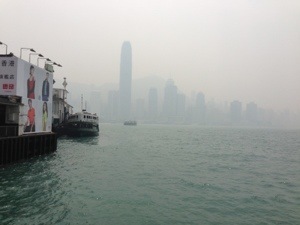 Most Harbours are good Hong Kong’s is spectacular if you can see it. Nostalgic for Sydney. Still, I love the old-time feel of the Star and the navy blue Gene Kelly sailor suits the crew wear. Imagine trying to get the Sydney deckies to do the same. I had a couple of beers left over from China including this Pineapple beer, which is quite common in Chinese convenience stores and supermarkets. At 1.8RMB or 27 cents Aussie it’s a bargain, but I paid $26 cents to much for it. Not even a good soft drink. The novelty value wore off after the first sip. 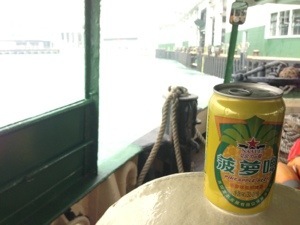 Aah, Back of the Ferry – taking one for the team do you don’t have to.